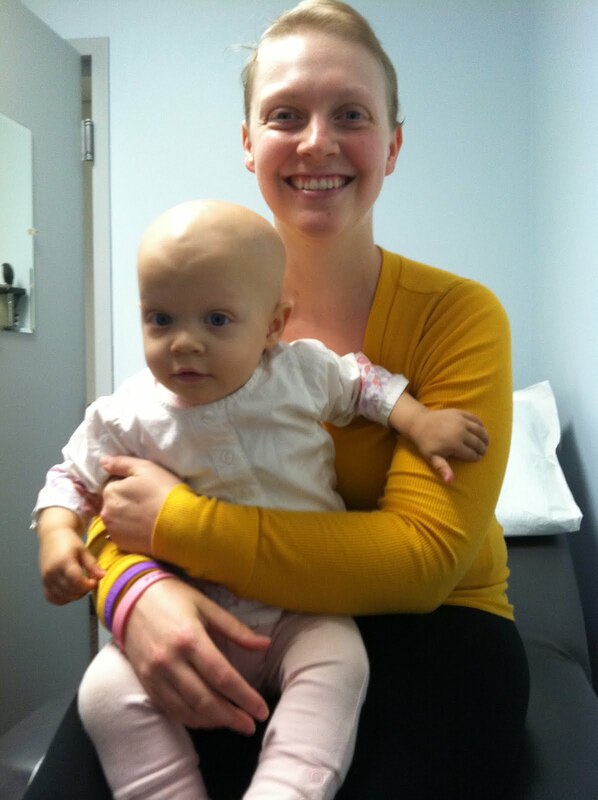 Saoirse has had many tests done, and so far things are going well. She had a type of central line called a pic line put in, and had her fully body CT and core biopsy. The biopsy came back as mostly dead tissue, and they determined that the tumors in her belly are most likely 80 - 90 percent dead. This shows that the tumors are fast growing (they die because they outgrow their own blood supply), and means that they should respond to chemotherapy very well. Because they needed viable tissue to do the biological testing that determines her treatment, the doctors moved her bone marrow biopsy from Monday to Saturday morning. The cancer is in her bone marrow, which was expected, and the doctors were able to get enough tissue to do all of the biological testing. This means she will not have to have an additional surgical biopsy done to try and collect live tumor, and it also means that she is definitely in stage 4 disease. Saoirse has had two nights of chemo, and has her last one tonight. There has already been improvement in the swelling in her eyes, and the doctors are very glad to see how well she is doing. Her face is starting to look more like her, and she is beginning to perk up and want to do more normal things. She ate quite well today, and is loving squash, jello and ice cream. Tomorrow we have a bone scan and there will be some more tests and doctor visits over the week. She could come home as early as Tuesday, but more than likely we will stay until Wednesday or Thursday. I just want her to be ready for coming home and for it to be a good experience for her. I have my doctor appointments on Wednesday and then my chemo on Friday morning in Gloucester. I'm going to be working with the doctors and nurses here tomorrow to get a schedule written out for the next few days so that we can plan for appointments and scans that both of us have to do, so that we don't end up having to be in two places at once. I'll also be working with one of the Dana-Farber resource advisors to apply for financial assistance, and to get any paperwork in order that needs to be filed for Mike's human resources at work, and for any assistance programs. They have really helped to show us that there are ways to get help. I'm hoping to keep seeing improvement in Saoirse as the week goes on. I'm sure she will look even better tomorrow and I think she'll want to play some. If the weather is nice, I think maybe we will try and get down to the courtyard so she can go outside for a bit. She seemed to enjoy looking out the window today. Most of the families, nurses, and doctors are shocked and astounded when they find out that mother and daughter are going through chemo at the same time. The ophthalmologist (or optometrist, I can never keep those straight) thought I was kidding (I'm not sure why I would kid about that, but I suppose that's just an expression of disbelief). In a way, I feel like I can help interpret some of what she's feeling because I know how I feel when I have my treatments. I really think that will help me to help her even more. I think my sister had the best explanation - In a way it's good I got it first, because I already know what she's going to feel like and I can help her get through it. I think that's a pretty good way to look at things. I heard the news from my mom and then your mom sent a detailed email with a link to your Blog. I am so very sorry sweetie. Please let me know if there is anything I can do to help you. My heart is breaking just imagining what you, Mike and the baby are going through at this time. I told John, who is now 11, about his baby cousin and he was so sad to hear the news. Reading your Blog was comforting as you explain things so well. I will stay posted. Our thoughts and prayers are with you all. You are so strong. If anyone can pull through this, it's you. I am here if you need anything - and I mean anything - a hot meal, house cleaning, or an ice cream delivery. "In a way it's good I got it first, because I already know what she's going to feel like and I can help her get through it." This is a situation with no good sides, no silver lining, and you have managed to find a good side to it. I know that this positive attitude is going to help bring you and Saoirse through this awful time. I'm so glad you have this blog to keep us all informed. You and Saoirse are in our thought constantly up here, and we wish you both speedy recoveries. Keep us posted on your progress.